It was great to work with our new clients and first time boat owners on their Beneteau 393. They plan to use the boat as a weekend getaway and to do some light cruising in Southern California. Although the bed cushions were in good condition, they were a little stiff and the clients were looking for some extra comfort. The beds were perfect candidates for toppers, which give the same feeling as a new mattress, but a bit more cost effective. If the original cushions are free of mold and mildew, and still hold their original shape, they are good candidate for a topper. Our clients used Sunbrella fabrics throughout, which will be very helpful in the pullman berth forward because of the bright hatches. 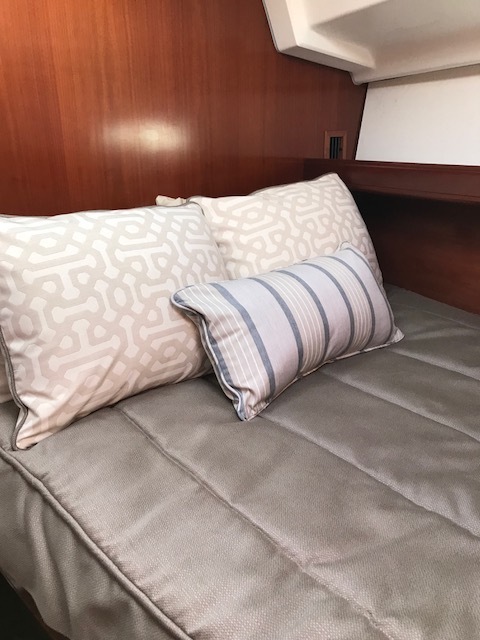 Toppers, custom sheets, Sferra blankets, quilted coverlets and pillows make each berth comfortable and cozy while also looking great. 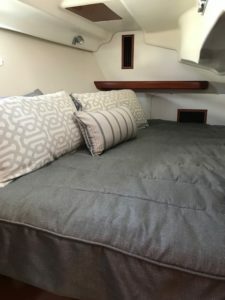 We got two thumbs up from the clients and we are sure their nights aboard will be much more comfortable.